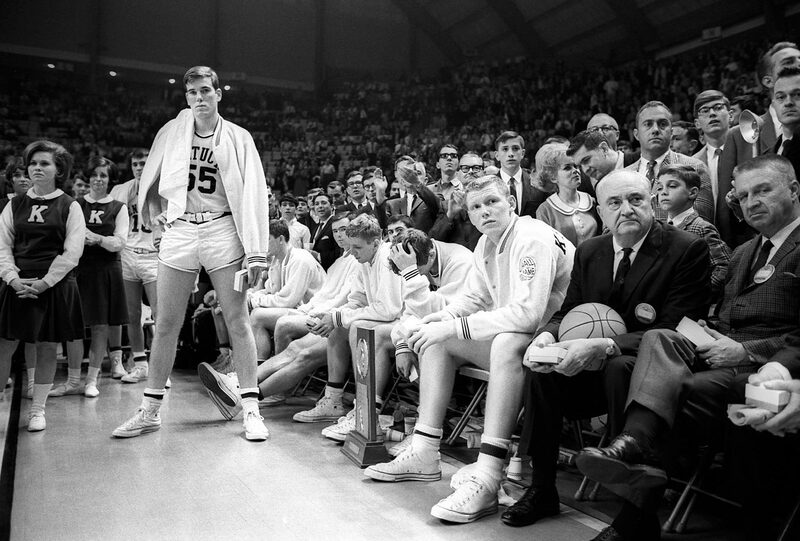 Texas Western's 1966 title win over Kentucky can be appreciated without tape of the game itself. Last night ESPN screened a grainy, washed-out tape of the 1966 NCAA title game in which Texas Western, with its five black starters, beat all-white Kentucky in what’s been called the Brown v. Board of Education of college basketball. And this morning I’m conflicted. I’m not sure whether to thank Bristol for letting me and countless others see the game for the first time, or curse the Worldwide Leader for messing with my memory. None of the Wildcats can bring themselves to face the camera, except for Kentucky’s Thad Jaracz, who, with arms akimbo, assumes a defiant pose. 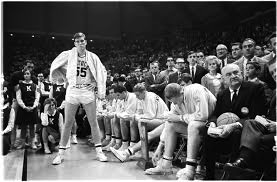 Between Jaracz, who fouled out; the weeping cheerleader submitting to the consolatory grasp of the man behind her; and Kentucky coach Adolph Rupp, who adamantly refused to recruit black players, Clarkson captures a monochrome world in black and white. And the photo’s composition is worthy of a Renaissance painting. Jaracz is nestled in the crook formed by the Kentucky bench and the outward flare of that line of cheerleaders. Rupp cradles a basketball, holding it—and the sport itself—close. That box in his hands surely contains some runner’s up trinket handed to him moments before. For symbolism’s sake, I’ve always hoped it’s a watch, a ticking timepiece to put Rupp abidingly on notice that change was gonna come. Please indulge me those last couple of paragraphs. They’re the ruminations of a lingerer. Iconic moments, in sports and elsewhere, have a way of putting forth still images to make their case to posterity. We spend time with the lone man halting the advance of that Chinese Red Army tank, and with the sailor and woman in the white dress sharing a kiss in Times Square on V-J Day. So too with sports moments: Bill Mazeroski headed home, fans from the stands already over the railing; Bob Beamon sailing spikes-first through the drizzle of Mexico City; Muhammad Ali over Sonny Liston, scowling. The Greeks have a word for this practice of mining an image for meaning. They call it ekphrasis. For me, thinking back on that Texas Western victory, even after hearing Miners coach Don Haskins on the subject over the years, and seeing Glory Road, Hollywood’s stab at it, has always been to engage in an ekphrastic exercise, thanks to the work of men like Rich Clarkson. And then came last night. To be sure, there was value in those 90 minutes, even if John Saunders, Jay Bilas and Michael Wilbon could have grappled more substantively with the segregation in place at the time. I had no idea that Kentucky used a 1-3-1 half-court trap for the entire game. Between the surgical way the Miners, particularly Hill, cut that defense up and their cold-blooded free-throw shooting to put the game away, the ball-control, make-no-mistakes ideology of Haskins’ mentor, Henry Iba, was as responsible for beating Rupp as was the ascendant African-American ballplayer. With no shot clock, the Miners used most of the final minute of the first half to tease Kentucky, passing into and around that trap before scoring on a layup. In the grand scheme of things, no, Texas Western wasn’t hosed by the refs. But a number of calls didn’t pass the eye test, and it seemed as if the Miners got the short end of them. Which only further flatters their title-worthy poise. A low rumble of crowd grumpiness seems to play in the background. Whether it’s Kentucky fans in Maryland’s Cole Field House voicing their portent, or just poor audio, I couldn’t tell. In the run of play, the three-point play by Texas Western’s David (Big Daddy) Lattin in the opening moments, a dunk plus and-one, doesn’t seem like the historical clarion call it has always been touted to be. 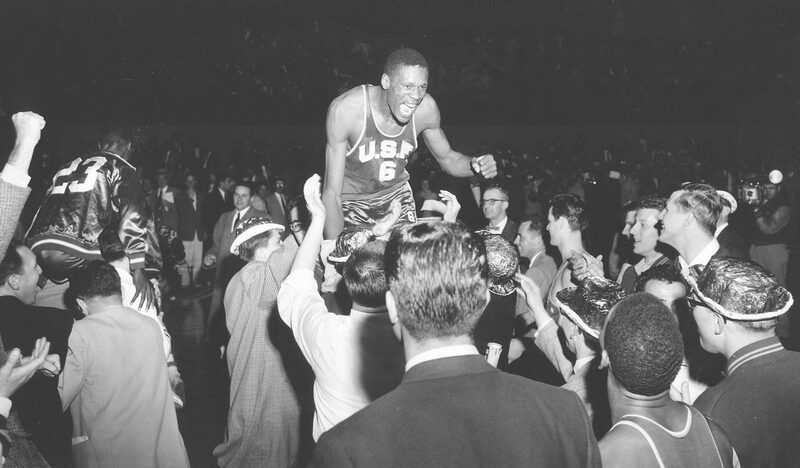 San Francisco's Bill Russell gets a ride off the court after defeating La Salle, 77-63, to win the title in Kansas City. Russell was named most outstanding player after scoring 47 points. 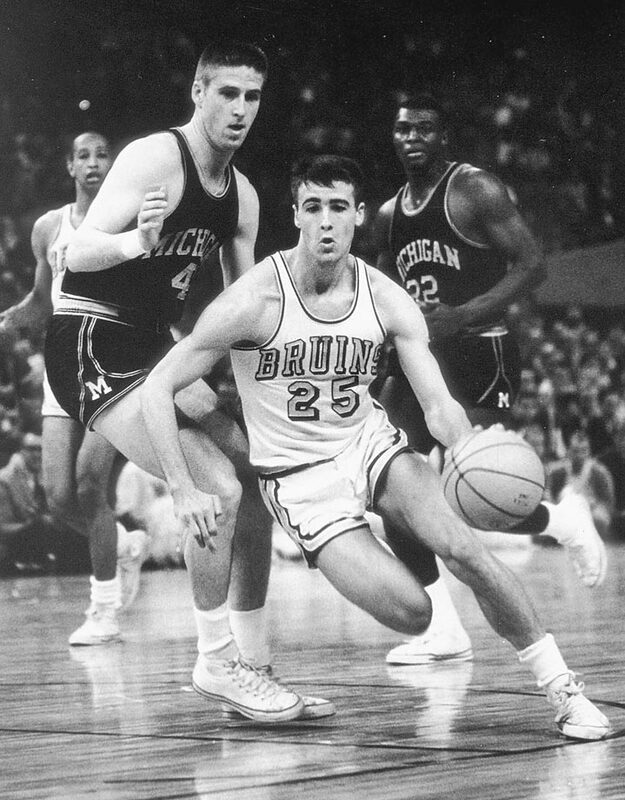 UCLA guard Gail Goodrich drives against Michigan during the Final Four held in Portland. UCLA won 91-80 to take the title. Kentucky coach Adolph Rupp (with basketball) and his players watch as Texas Western receives the championship trophy. Kentucky lost 72-65 after Texas Western's Bobby Joe Hill had successive steals to turn the game around. 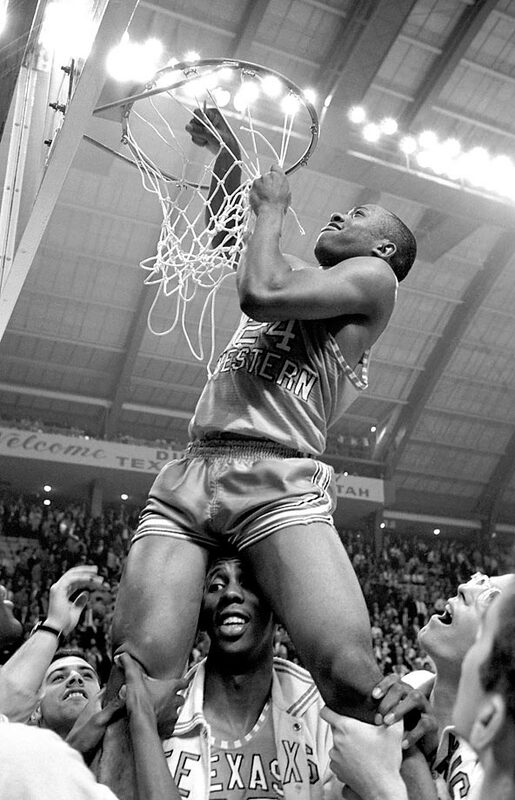 Texas Western guard Willie Worsley is pictured during the 1966 championship game. Texas Western defeated Kentucky in the final and Utah in one of the semifinals. 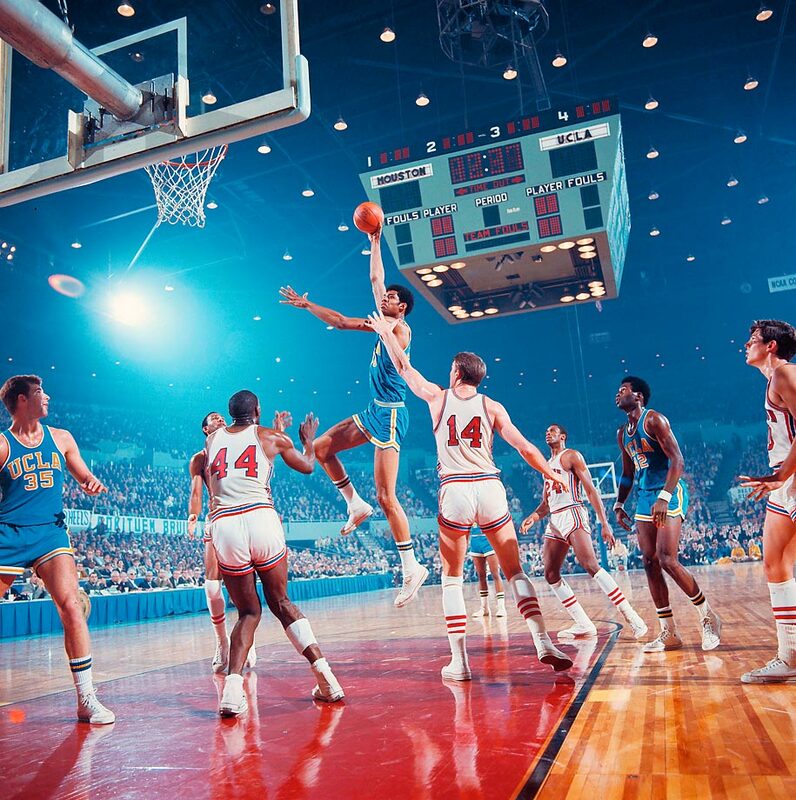 UCLA center Lew Alcindor shoots his trademark sky hook during the Final Four semifinal game in Los Angeles. Also pictured is UCLA forward Mike Lynn (35), guard Lucius Allen (42), Houston forward Elvin Hayes (44), center Ken Spain (14) and guard Don Chaney (24). UCLA defeated the Cougars 101-69 to meet North Carolina in the championship game. 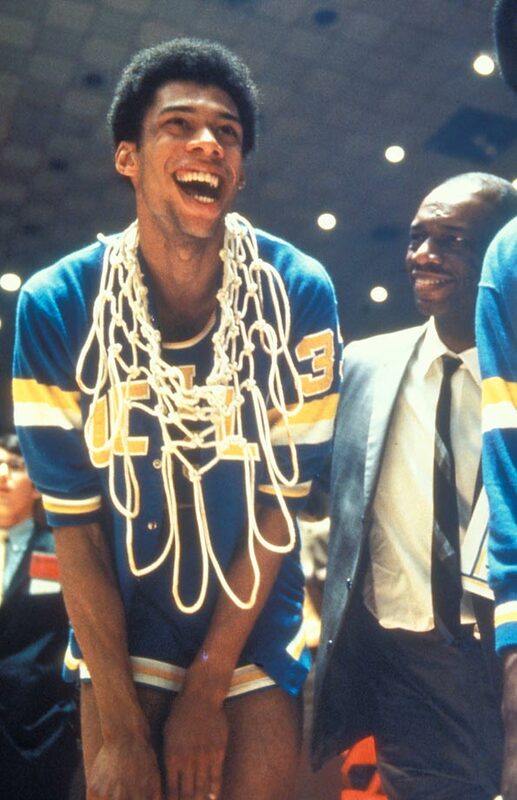 UCLA's Lew Alcindor accepts congratulations from his father after winning the title in 1969 with a 92-72 victory over Purdue. 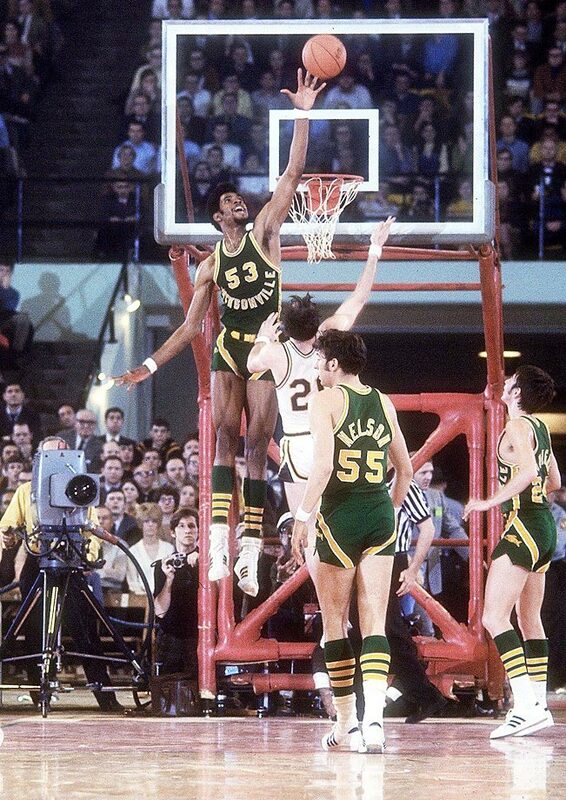 Artis Gilmore blocks a shot at a Final Four semifinal held in College Park, Md. Jacksonville defeated St. Bonaventure 91-83 to face UCLA in the championship game. 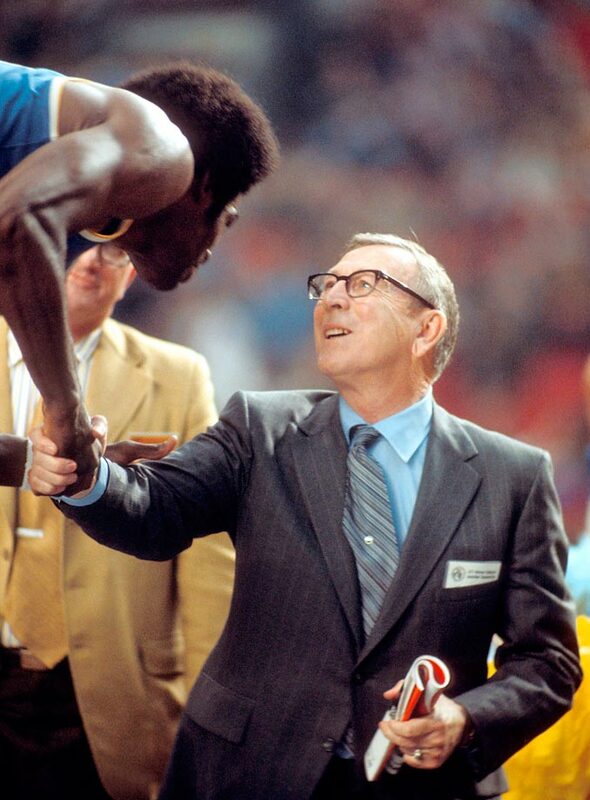 In what he calls his favorite photo, UCLA coach John Wooden accepts congratulations and thanks from Sidney Wicks following the team's 68-62 victory over Villanova during the Final Four. Wicks was a starter on three Bruin championship teams. 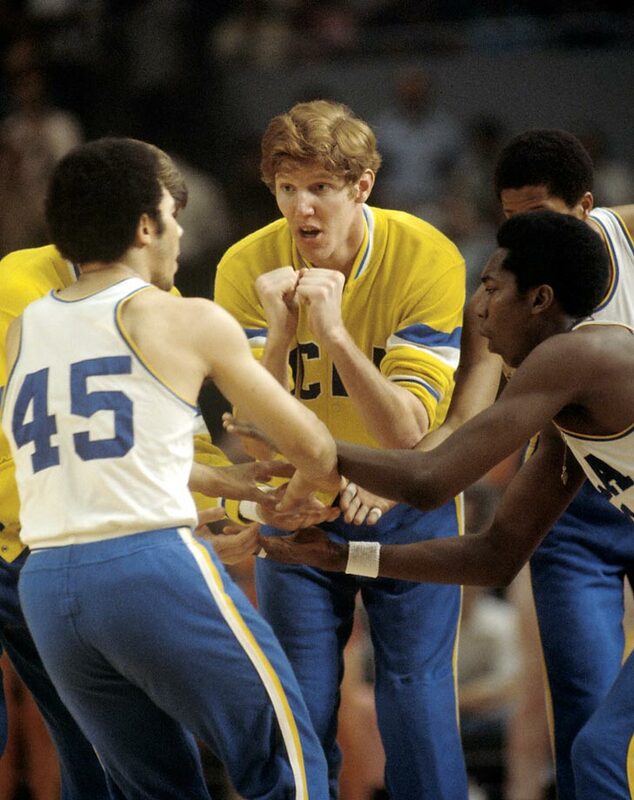 UCLA's Bill Walton before the start of the championship game with Memphis State held in St. Louis. UCLA won 87-66. 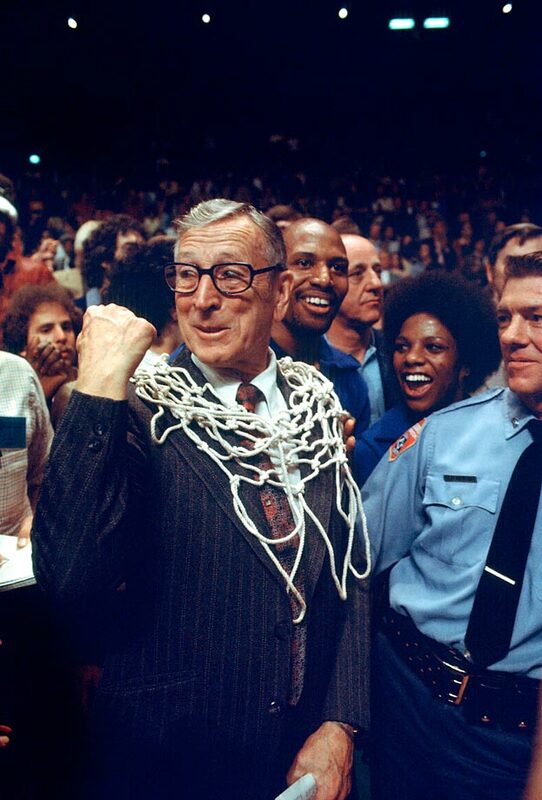 UCLA coach John Wooden pumps his fist after a 92-85 victroy over Kentucky in the 1975 title game in San Diego. 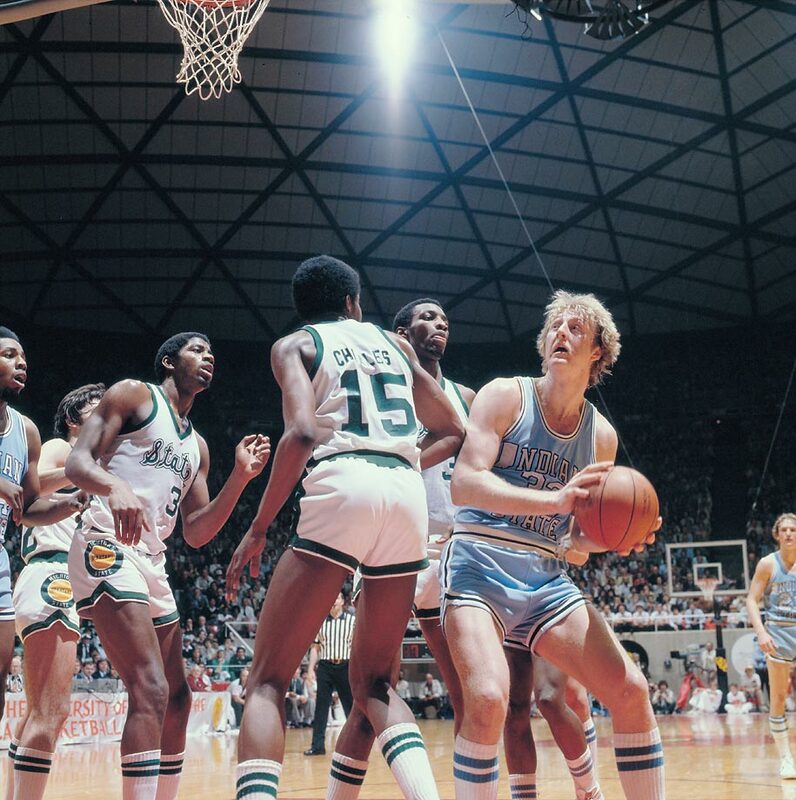 Michigan State guard Earvin "Magic" Johnson, forward Ron Charles and Indiana State forward Larry Bird during the title game, won by the Spartans, 75-64. 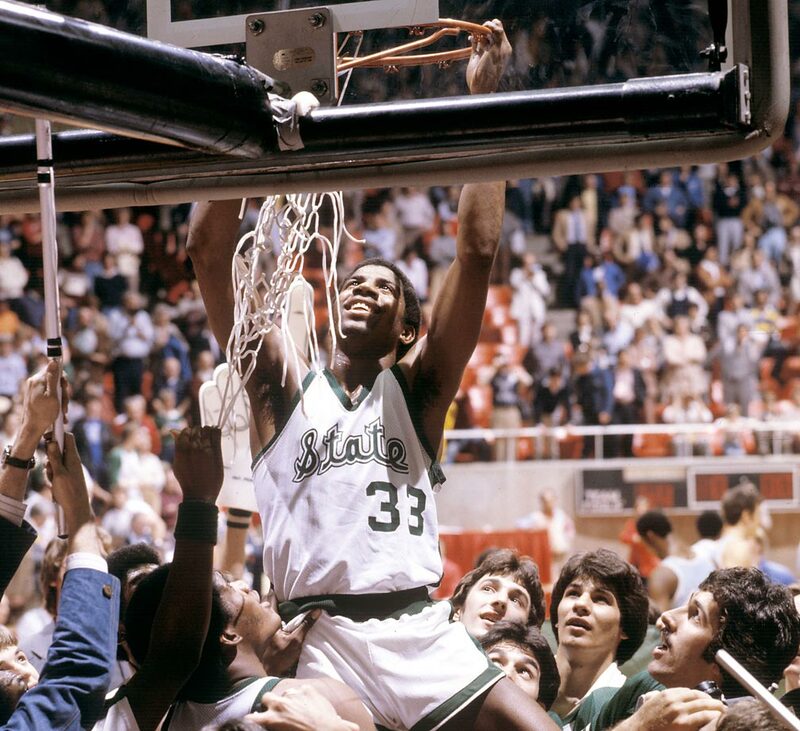 Michigan State guard Earvin "Magic" Johnson cuts down the net after the title game. Johnson was named Most Outstanding Player in the 75-64 victory. 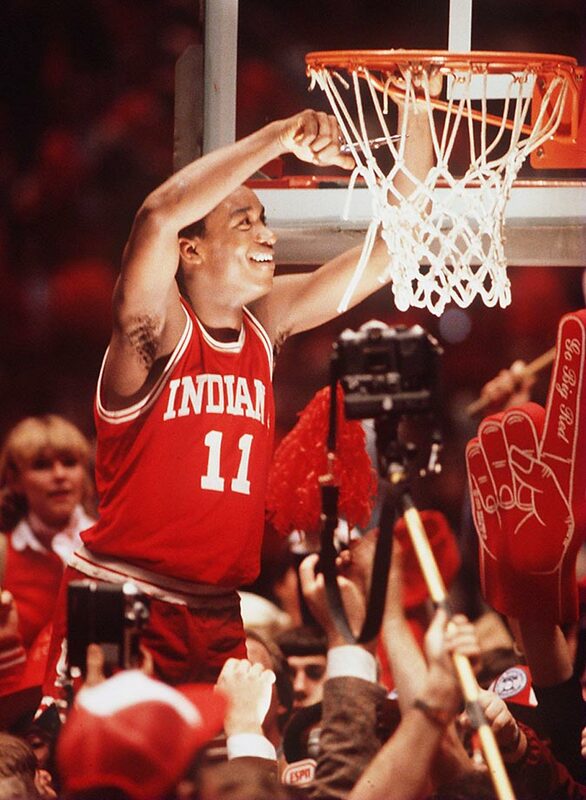 Indiana point guard Isiah Thomas cuts down the net after the Hoosiers defeated LSU 67-49 in the Final Four semifinal. 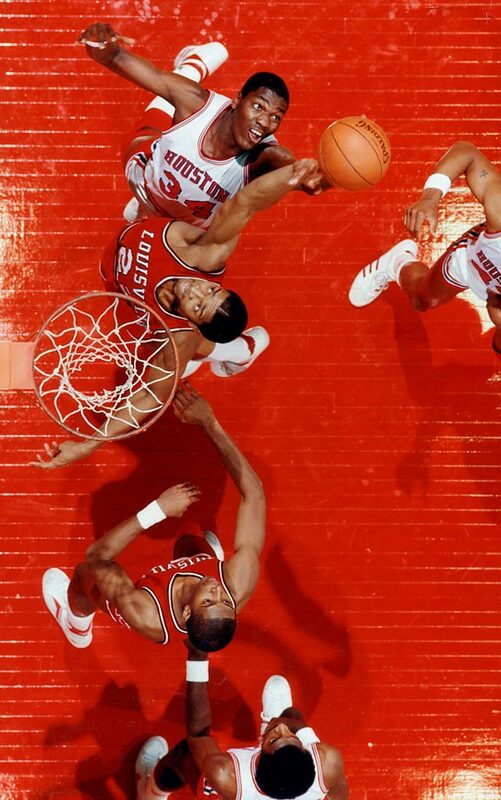 Houston's Akeem Olajuwon (34) and Louisville's Rodney McCray battle during a Final Four semifinal in Albuquerque. 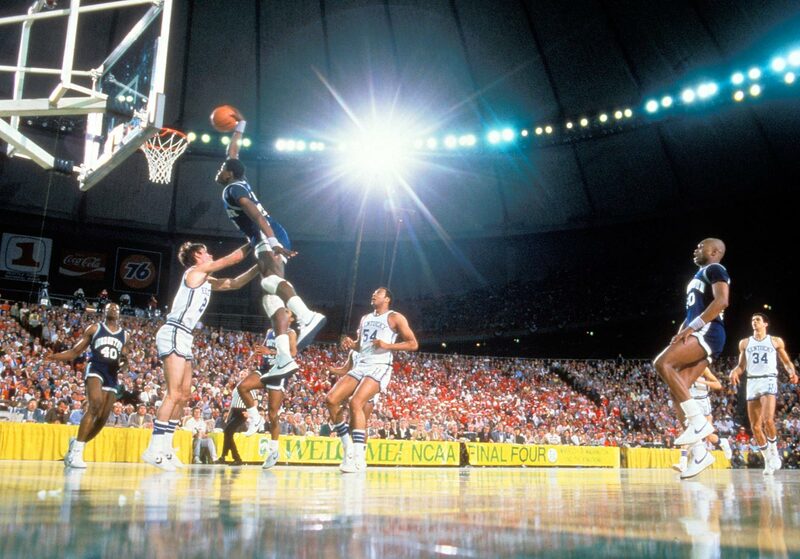 Houston won 80-68 in overtime and Olajuwon was later named Most Outstanding Player of the tournament. 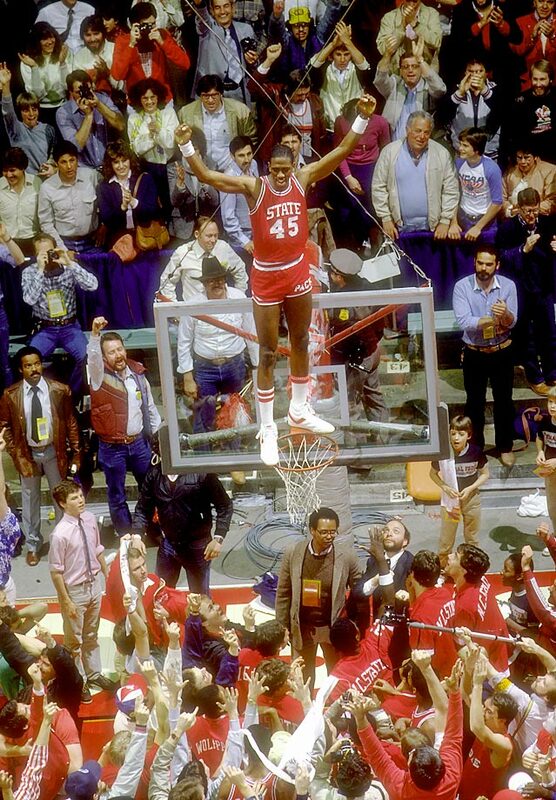 North Carolina State center Cozell McQueen celebrates their 54-52 victory over Houston in the championship, held in Albuquerque, N.M.
Patrick Ewing of Georgetown goes up for a signature dunk during a Final Four semifinal in Seattle. Georgetown defeated Kentucky 53-40 to advance to the championship game. 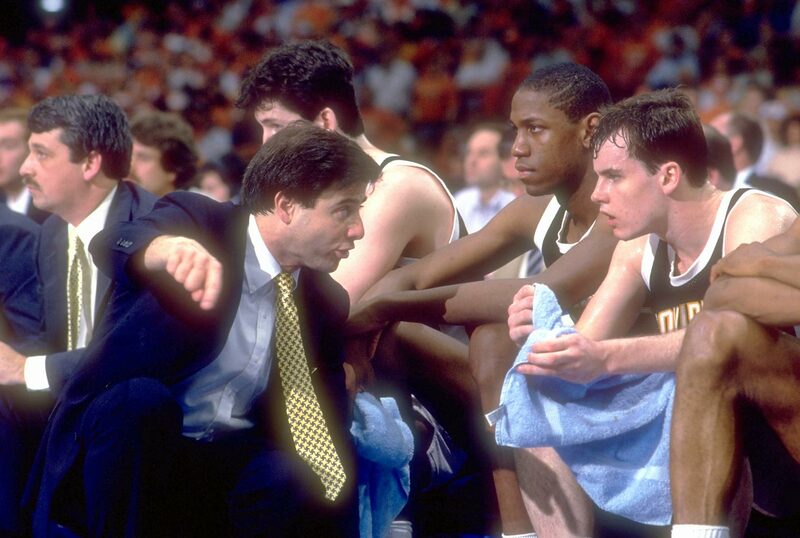 Providence coach Rick Pitino talks to point guard Billy Donovan during the Final Four. 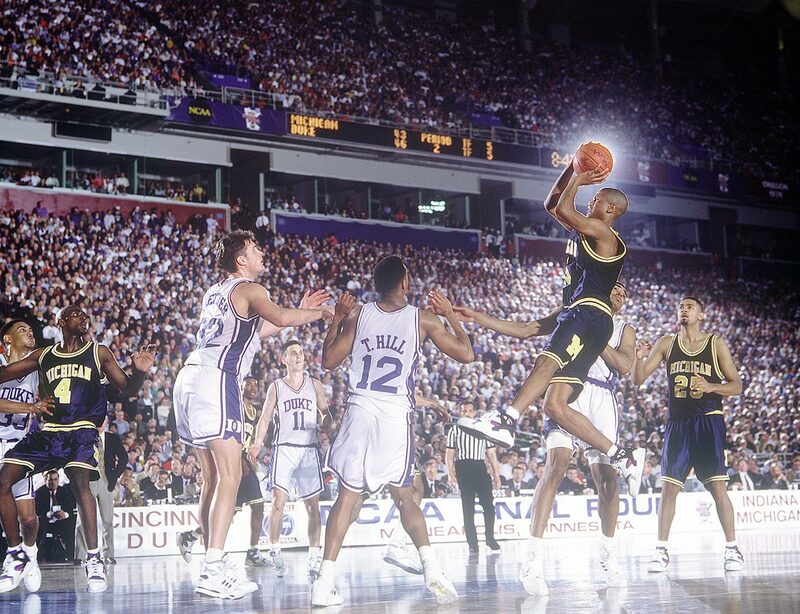 Jalen Rose of Michigan shoots a jumper over Antonio Lang of Duke in the final. Duke defeated Michigan 71-51. 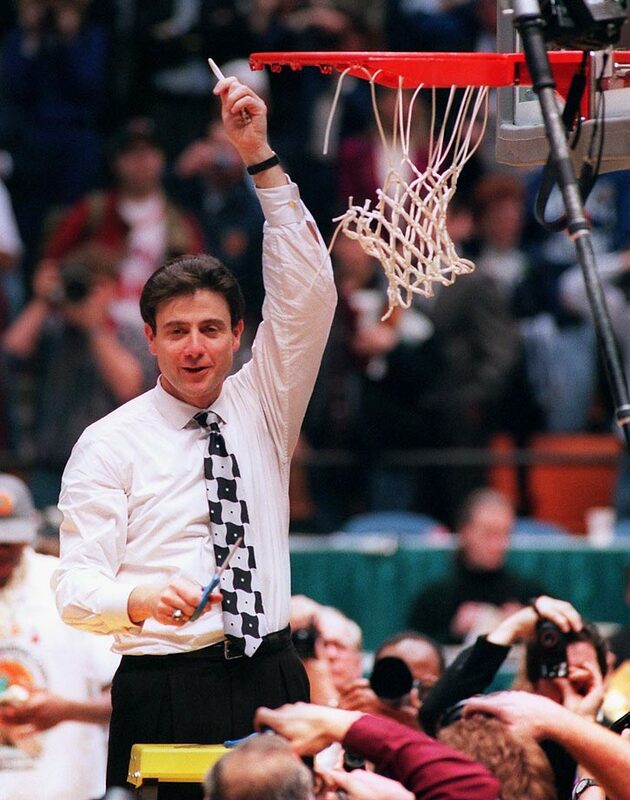 Rick Pitino celebrates Kentucky's championship. Mario Chalmers sinks a three-pointer to send the title game against Memphis into overtime. The Jayhawks went onto defeat the Tigers 75-68. A little zip, indeed. Texas Western followed up Hill’s second breakaway layup with another dunk from Lattin. But I was less taken by Big Daddy’s dunks—inured, perhaps, by the dunk’s ubiquity today—than by the Miners’ defensive rebounds. Here was the territorial assertiveness I’d read and heard about: majestic, thunder-clapping, elbow-flexing, stand-your-ground snatches that seemed to admonish any Wildcat foolish enough to miss a shot. So it did indeed. In the run-up to and immediate aftermath of the game, no one spoke of making history or breaking barriers. It took a week or two for the backlash to reach Haskins’ office—some 40,000 pieces of hate mail and a dozen death threats over the next year. The further you get away from it, the bigger it gets is the very definition of a great moment. If in this case it takes a half-century to fully appreciate a moment’s size, that may be less because of the power of moving images, which ESPN chose to air on a big, round-number anniversary; and more because of the power of frozen ones, which we can take our time with and go back to again and again. The next time Texas Western’s big round number comes up, I’m still going to the stills.